Friendsgiving is a tradition created several years ago by my good friend and culinary counterpart, Amy. The idea was both simple and magical – gather your closest foodie friends the weekend before Thanksgiving and put on the most amazing dinner party your Tamis and Chinois will allow. I loved the idea so much that I proceeded to carry the torch kitchen-aid through the hot desert into the cool San Diego sunset. So, needless to say I spent the better part of the last two months pawing through my cookbooks looking for the perfect cheese course, soup or amuse bouche and boring Steve to death with details of the perfect flowers to adorn the table, how I must go to Anthropologie for another set of plates, and wondering if our friends would care that we were eating in the living room on two desks converted to a giant table with pieces of plywood. During my “research” period we ate a few too many unbalanced meals of sugary, buttery sweet potatoes while testing recipes for Friendsgiving. 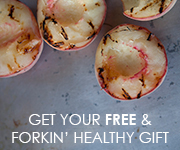 We started with appetizers, naturally, and even began testing them out with friends. Appetizers are incredibly important to a dinner party. They set the tone for the whole meal so you want them to make your taste buds dance with excitement while being light enough that when the entree comes around your belly isn’t begging you to stop. There was one appetizer in particular that was a universal hit, but we realized that by the time Friendsgiving came around nearly everyone invited had already sampled it and I couldn’t possibly have a repeat so I nixed it from the menu. But I couldn’t let something so delicious and simple be brushed under the rug like a rogue dust bunny. 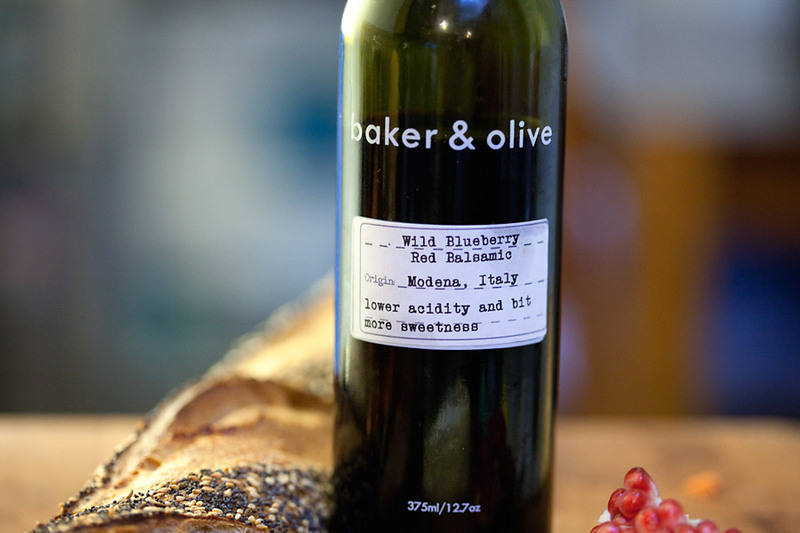 Our shining star was a goat-brie cheese blend smeared on a toasted seeded baguette, drizzled with Blueberry Balsamic reduction and pomegranate seeds. The combination of the goat and Brie was creamy with just a little pungent punch – just enough to cut through the sweetness of the reduced blueberry reduction. 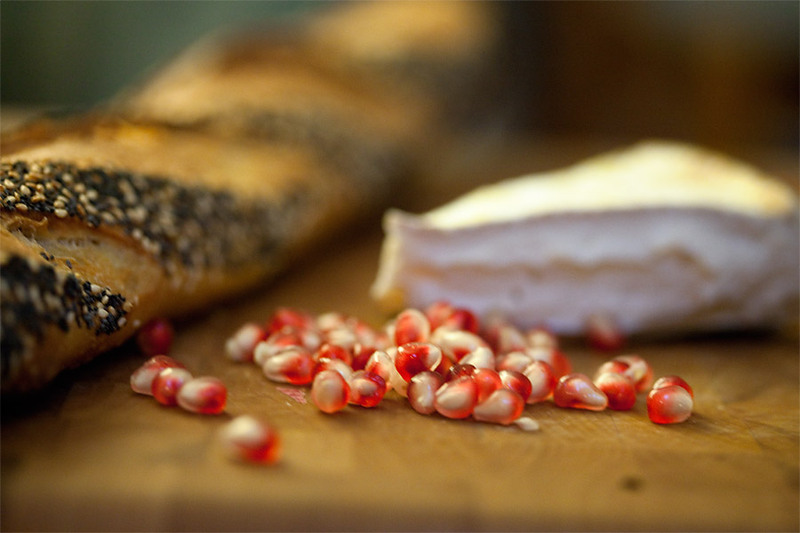 The slightly tart pomegranates added a hint of color and a pop of flavor that rounded out the dish. Please make this dish, invite some friends over and start your own Friendsgiving. 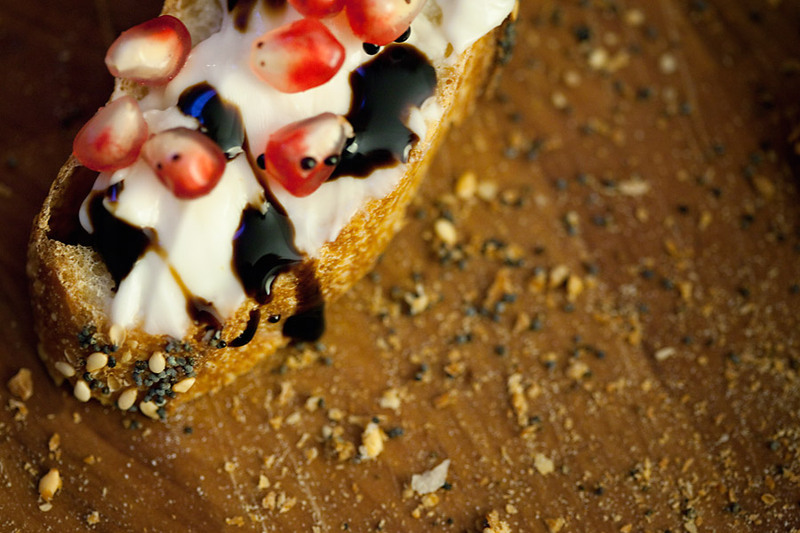 Spread the cheese on the hot bread, drizzle with the syrup and sprinkle with pomegranate seeds. « don’t worry, i’ll save you.